You succeed once, no one remembers. You fail once, everyone remembers. One of the harshest and painful realities of life I'm still learning to handle. Success in the form of awards and achievements easily fade away. This further taught me not to develop any attachment to any form of success. Savoring success once is enough. Another irony about success, people tend to raise their expectations and standards. More success, more pressure, more stress ... life shouldn't be lived this way. The problem with failing once, people tend to build that stigma of weakness against the unfortunate being. It's like being forever punished for a mistake that only happened once. While I cannot change the perception of everyone, I TRY MY BEST not to join the crowd of this ironic norm. I try to seek balance over the contradicting situations. At the workplace on one hand, I sometimes cannot blame colleagues who refuse to trust the hard headed and non-performing colleagues. On the other hand, I don't want to see and identify myself in the group of the antagonists. I'd rather be someone who provided opportunities for people who have the sincerest intention of redeeming themselves. 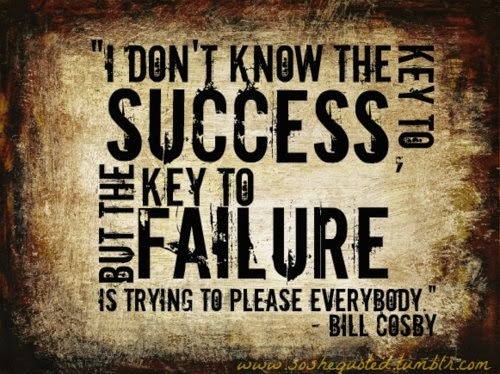 While I don't often read self-help or inspirational books, one of the best quotes about failures and success is from Bill Cosby. I can totally relate. I've made some mistakes in the past and until now I feel like I'm being punished for it even though I've already proven them wrong. Sad truth but we can never really change what people think of us. So what we should just do is forget trying to please them.